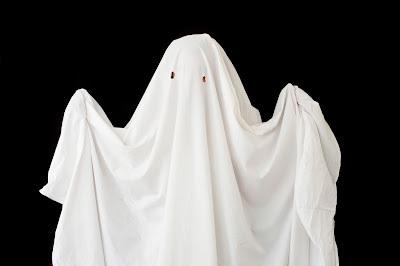 Jared Unzipped: The Origin Of The Bed Sheet Ghost. One of the most easily recognizable elements of the Halloween season is the ghost. Eerily haunting unsuspecting homeowners with loud wails of torturous pain, the ghost is as much a symbol of the holiday as the jack-o-lantern or a witch. Undoubtedly, nearly every child has masqueraded at least once as a ghost for All Hallow's Eve. The costume is simple, yet visually striking and effective. The recipe for a ghost costume is astoundingly easy. Acquire a white bed sheet. Cut two holes for eyes in the bed sheet. Yet, when we watch movies that feature ghosts, they're never presented as hovering sheets. What gives? 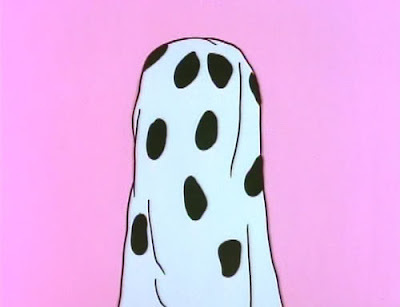 Well, I discovered the origin of the Bed Sheet Ghost... and it's not as mysterious as you might think. Ghosts have always been a popular component in classical theater productions. More often than not, they were presented as armored haunts -- specters wearing suits of armor, whom may have died in the heat of battle. They would creak and clang on stage when moving. Sometimes they'd have genuine actors inside to move the armor. Other times, they'd be operated much like a puppet on strings. Yet, the tastes of the theater-going public began to change in the 1800's. Audiences started to see armored ghosts as silly and nonthreatening. To remedy this problem and make ghostly characters seem more spooky, theater producers began using linens to represent them. They figured a floating sheet with no visible feet nor body would appear dramatically scarier than a humanoid figure in a suit of armor. The change-over was a successful venture and the concept of the Bed Sheet Ghost stuck. Surprise! Every time you dress up as a ghost with a bed sheet, you're sharing a bit of classic theater production with the world. Now remember -- just cut TWO holes in the sheet. Don't make the same mistake as Charlie Brown. Prepare to get a lot of rocks. This is an episode when Bee was four years old. These sheets will compliment the bedroom stylistic layout while adding style and flare to the bedding. Complement, not compliment. The sheets aren't telling your bedroom how good its hair looks. They're enhancing the bedroom.